As shopping behaviours continue to shift with the emphasis on digital, retailers can predict that consumer habits will considerably alter as technology such as artificial intelligence (AI) becomes more widespread across the marketplace. Artificial intelligence already exists in smartphone devices across the board, but the convenience and potential profitability that AI provides makes it especially desirable in retail. Retailers can put artificial intelligence to work in many different forms, from creating a more personalised shopping experience for the consumer, to helping adopt a data-driven approach to retail marketing. ASOS Chief Executive, Nick Beighton, predicted that by 2020, mobile sales will account for 90% of total revenue for the retailer. With this in mind, retailers have to remain vigilant to changes in trends and expectations from shoppers. As customer traffic to mobile sites increases, it’s important that retailers offer a bespoke and personalised service to ensure shoppers can fluently find the products they require and thus convert to purchasing much quicker. Artificial intelligence is a term that has been bandied about the retail sector for many years, but only recently has the technology began to be appropriately deployed throughout the industry. 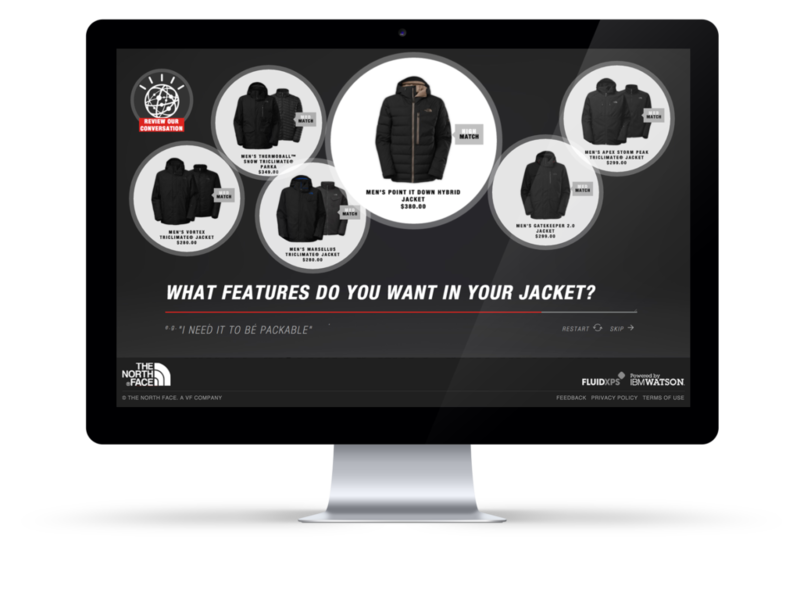 Outdoor specialist The North Face has been using the technology to help streamline its online visitors’ shopping cycle by asking the customer a series of questions to gradually hone in on the ideal product for them. This method has increasingly improved the shopping experience, as well as allowed the brand to extract valuable data on the habits of its consumers – improving customer retention – and ultimately deliver measurable and repeatable revenue uplift. 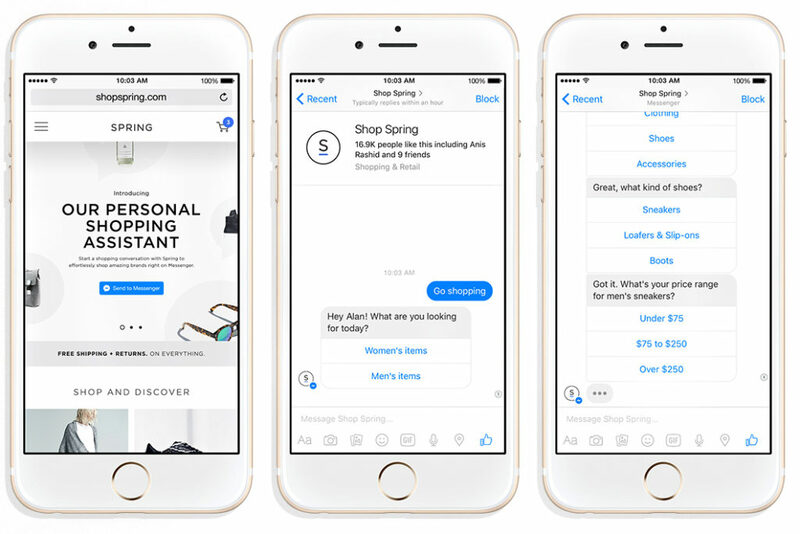 Facebook announced the launch of its bot store in April this year, and mCommerce start-up Spring was one of the first businesses to trial this. The AI is a very simple question-based interface, which asks a series of questions to the online shopper in order to narrow down a selection of products the bot deems best suited to the consumer’s needs. With over 900 million active users on Facebook messenger, and a significant 75% of Facebook users purchasing products online, it’s unsurprising that brands like Spring and The North Face are beginning to exploit the benefits that integrating artificial intelligence provides. The amalgam of the Facebook bot store and retailer is not strictly from a clothing perspective, as London-based startup IntelligentX has proved. The brand’s strapline is “the first beer brewed by artificial intelligence”, and this is precisely what the business achieved by using the Facebook messenger bot to grasp preferences on beer tastes from the public. In a similar structure to Spring, the bot gathers feedback from the consumer before an algorithm uses the answers to expand its knowledge – gradually altering the questions to receive better, unique feedback. The initial trial of this method – which lasted 12 months – has already seen recipes tweaked to its four main lines – Golden, Pale, Amber and Black – 11 times since they were first initially brewed. ASOS has recently revealed it’s potentially next to be beneficiary of artificial intelligence as the brand scales up to prepare for the vast increase of mobile sales. The brand is going one further than a data collection service, experimenting with the capabilities that voice-recognition provides to shoppers. This technology is predicted to be as advanced as iPhone’s AI assistant Siri, which allows users to complete spotlight searches for a particular item amongst the remote database. This voice-recognition technology is likely to respond to questions from online shoppers, such as informing them when a particular item is back in stock. Coupled with the shopper AI which asks consumers a series of questions to gauge what they should be purchasing, this will provide ASOS with an incredibly detailed database of its users’ psychographics, allowing the retailer to further improve its online store with strategically placed products that not only optimise the customer’s experience, but also maximise sales for the retailer. mCommerce is no longer a trend, it is factually and statistically proven to be the ever-increasing method of shopping in modern day, and mCommerce is only expected to continue dominating the market-place as more consumers convert to mobile methods. With this in mind, artificial intelligence will continue to develop and shape the way people complete their online shopping. AI has a long way to progress from a simple question-based interface, but with many retailers taking step forwards to implement it as part of the core shopping channel, it will only be a matter of time before these advancements are released to the public. What do you predict will be the next artificial intelligence trend? Would you like to see these updates rolled out as a standard for all retailers? Let us know in the comment section below.